Tomorrow, is Ella's Third Birthday. 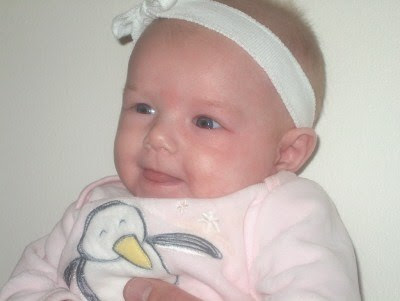 As I am looking through my photos of her as a baby, I just can't believe how she is growing. When we moved to Iowa, she had just turned one, was barely talking, and didn't have an ounce of hair. Now she talks to anyone that will listen and loves to have her hair done while she brushes her teeth in the morning. Ella loves Cinderella and it is her movie of choice right now. We think it is so funny that she doesn't want to pretend to be Cinderella, but she is Anastasia, the wicked stepsister that rips Cinderella's dress. That is her favorite part. Peter Pan and The Incredibles are also her favorites. Ella loves books and can be found asleep in her bed at night surrounded by all of her favorites. She still loves Curious George books, and Little Critter is a new favorite. But basically anything that you will read to her, she loves. The usual evening routine for Ella once she is in bed is Craig or I will read to her and then when the other comes to say goodnight, they will be talked into reading another three books also. Sometimes Christian also reads to her, so on any given night she can have NINE books read to her! It is just her excuse so she doesn't have to go to sleep. Ella loves being the youngest and pushing the chair up to the kitchen counter to wash the dishes or help with the cooking. She loves going anywhere in the car with her dad also. She enjoys seeing her friends at Sydnee's dance class, in nursery at church, and having playdates with Hallie and Reese. Since Ella and I are home during the day together, we love the quiet time playing games, walking outside, and shopping or running errands. Hopefully she will be fully potty trained in the coming months, but we are in no hurry. We love you, Ella! Happy Third Birthday! Today it was raining when I woke up to get the kids ready for school. This kind of weather hasn't been around in awhile, so I am enjoying it. Cleaned the house all day yesterday and did a mountain of laundry. Ella and I are ready to go to the library and run a few errands. Just a regular Tuesday, nothing out of the ordinary or funny to say. Just that it is raining, and I like it. My favorite time of year is here. The leaves are turning, the air is cool, and pumkins are everywhere. I love Iowa in the Fall. Here, we have a long autumn season. All sorts of places have started carrying pumpkin treats of all sorts. I love pumpkin; the taste and the smell. My sister, Kara, shared a new favorite drink and I went right out to try it. It is at Starbucks, and is called a Pumpkin Spice Frappachino Light Blended Creme. Since I am not a fan of coffee, it is made with lowfat milk. This is perfect right now because it is not cool enough for a hot drink, but still warm enough for an iced drink. So, so yummy. Try it, you will love it! I just have to record the conversation that I had with my children at the dinner table last night. Dad was working late so we were just sitting around eating corn dogs, quesadillas, and fries. Very nutritious. We were just talking about Grandpa and Grandma Burton and how they were in Disneyland that day. Christian then said that he was the only child in our family that had been to Disneyland. Sydnee then argued that she had also been to Disneyland, because I was pregnant and she had been in mom's belly when we were last there. Christian: "Well, you couldn't see anything except the front of her stomach." We were all on the floor laughing. Even Ella. Sorry, just had to write about it here. What funny kids I have! Do you have lots of summer memories or favorite summer photos? Here is an album that you can put all of your best into! The Rusty Pickle Summertime class is this Saturday, Sept. 22nd, from 2-5 pm. Call Scrapaganza @ (563)391-0099 to sign up! Kits will also be available for $30. You will love all the papers and embellies for this project! Here is just a few of the pages and the cover. You will be painting, inking, and doing lots of layering to finish this fun album. It is all the best from Rusty Pickle! Sydnee started dance again last week. She was on the fence about if she wanted to continue to take tap and ballet. I am glad that we are continuing, because she loves it. Her teacher, Ms. Shelly, is super creative. Sydnee's favorite part of dance is when Ms. Shelly reads a story and they get to dance to different parts of the book. This video is of a silly game that they play at the end of class. Enjoy! Soccer season started and Grandpa would be impressed with Christian's skills. He is really enjoying the game and our family has a great time watching his team play. Dad and Christian have been enjoying the golf game, but not quite enough. Craig works really, really, hard. And his job is like any job, super stressful. Sometimes I have to really try to tempt him with a game of golf with Christian or an evening watching football. He is always grateful when he takes some time to relax. Ella and I celebrated the kids going back to school last Monday with a trip to Chuck E. Cheese. She has been begging us to take her there all summer. Since we haven't been since last winter, I thought it was about time. There was no one there but us...and she had a great time. Now she keeps asking to go to Jungle Bungle. One playland is enough for me. We also had some great storms this week, and with that always comes a great rainbow. This picture isn't that great, but I promise some better ones that my neighbor captured as soon as she gets them to me. I love a rainbow. It is the perfect sign of hope in times of struggle or storm. I have also been working on lots of paper projects, but they are secret....more to share in the weeks to come! Found this on Brittany's blog. It is pretty funny. Some other rock songs that really keep me moving! I never thought that an 8 year old's Ipod would make me look forward to exercising every morning!